Shot some hoops with a couple drunk black guys at 9am this morning. They played rough but man they couldn't shoot and fell on top of each other several times. I got a good workout tying them into knots. Then my wife and I went exploring around the neighborhood which we've lived in for a year now but we're always finding wacky houses, chickens, free shoes, and other stuff. 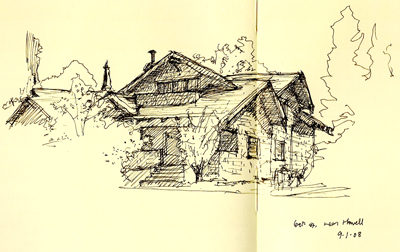 I sketched this house today, just to warm up the sketching hand which seems to get so little use with all the digital work we do. 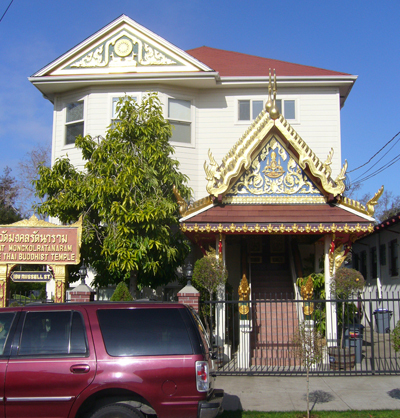 Right around the corner from our house is a Thai Buddhist temple which is pretty famous in Berkeley. They do a brunch every Sunday to raise money for a temple they want to build, in addition to the current one, a renovation of an old Berkeley house... This is my neighborhood, elegant Berkeley vernacular. This weekend marks the beginning of San Francisco's Architecture in the City. I'm looking forward to some things on the film festival, plus of course the Renzo Piano lecture and opening of his California Academy of Sciences. I'm not sure I like the building, but I will reserve final judgment for the opening. Next time: a 07/08 year recap.